We are pretty big fans of tacos, fajitas and pretty much anything with Mexican flavors! And of course we love simple, quick and easy meals. 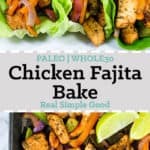 So, this Paleo and Whole30 chicken fajita bake is basically where all the things collide! 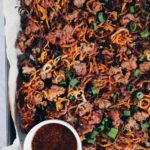 You will love this flavor-packed Paleo and Whole30 sheet pan meal that comes together in just 35 minutes. You know when you only have to dirty one pan and cleanup is a breeze – doesn’t that just feel right?! We love it when dinner comes together quickly and then also takes minimal time and effort to clean up. 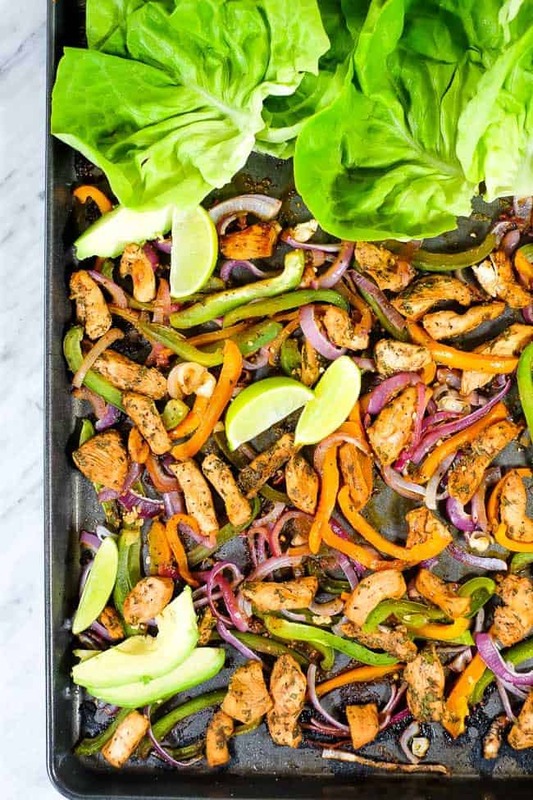 This chicken fajita bake is absolutely that! 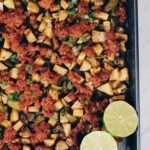 You prep the ingredients and toss them all on a large sheet pan. Then just bake and enjoy! After dinner is finished, just throw the leftovers in a glass storage container, the plates and the bowl from mixing the marinade in the dishwasher and wash ONE PAN! That is it! 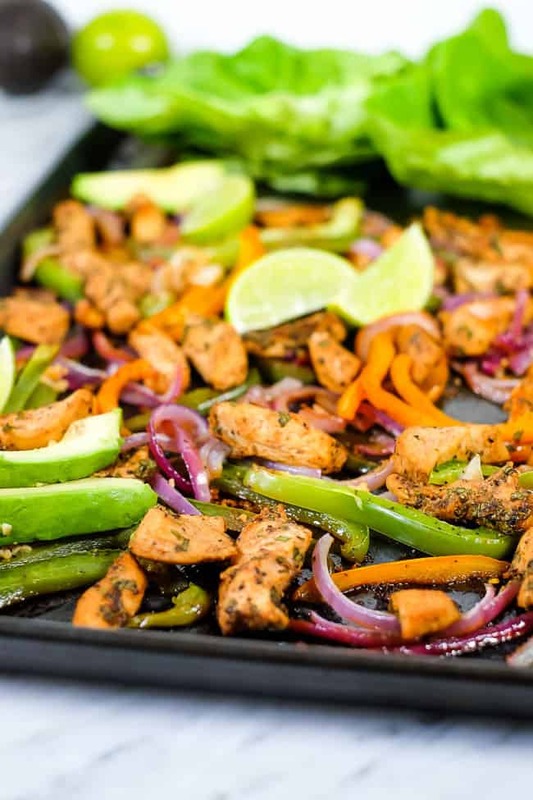 The marinade has your favorite fajita flavors – chili powder, cumin, lime juice and cilantro. We also added coconut aminos to give it a little more depth. 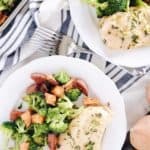 You can prep the chicken and let it marinate for up to 24 hours, but at a minimum get the chicken marinating at the very beginning of making this meal so it has more time to settle in and flavor the chicken. We used butter lettuce for the shells for this recipe the day we took pictures, but you could also use any other broad leaf green you like. Some of our favorites are bibb and romaine and also collard greens or swiss chard. 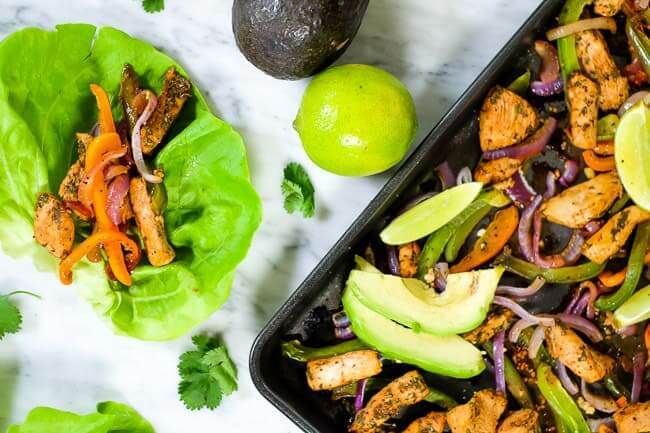 If you aren’t concerned with staying Whole30 compliant, you could also use Siete Family Foods grain-free tortillas because duh…they’re dang good! 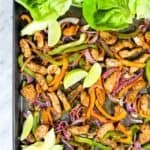 If you’re ready for a flavorful, yet simple and quick meal give this chicken fajita bake a try! It’s sure to be a hit for the whole family and you’ll appreciate the minimal effort and cleanup required! Let us know how it goes by leaving a comment below. Also, take a photo and tag us on Instagram @realsimplegood, so we can check it out! If you’re not already following us on Instagram, make sure to give us a follow so we can stay connected! We are huge fans of tacos, fajitas and pretty much anything with Mexican flavors! And of course we love simple, quick and easy meals. 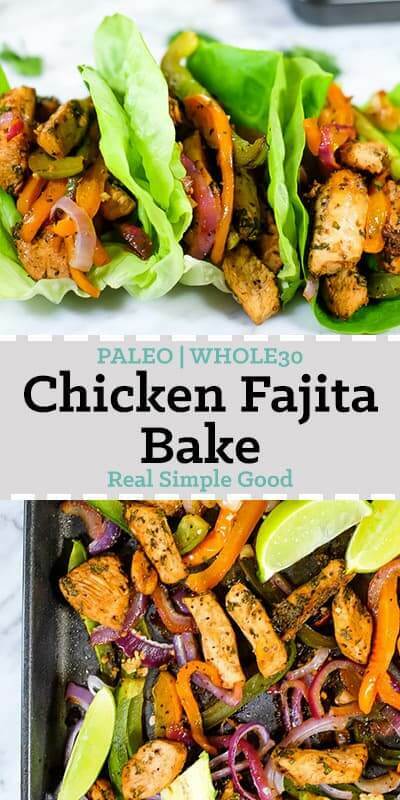 So, this Paleo and Whole30 chicken fajita bake is basically where all the things collide! 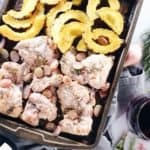 You'll love this flavor-packed Paleo and Whole30 sheet pan meal that's ready in just 35 minutes! 2 bunches broad leaf greens bibb, romaine, chard, etc. Prepare the marinade by mixing all of the marinade ingredients together in a bowl or shallow dish. Slice up your chicken into 1/2 by 1 inch strips. Place the chicken in the bowl/dish with the marinade. Mix well so that all of the strips are covered with the marinade. Set aside to marinate while you prepare the rest of the ingredients. NOTE: You can prepare the marinade and chicken in advance and marinate the chicken for up to 24 hours. Chop the onion, bell peppers and garlic as noted. Lightly grease a large sheet pan with 1 tbsp avocado oil. 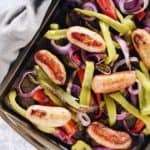 Spread the onion and bell pepper out on the sheet pan. Drizzle with 1 tbsp avocado oil and lightly sprinkle garlic, salt and pepper over everything. Toss to coat. Next, nestle the chicken pieces in with the veggies in the sheet pan. Spread everything out as evenly as possible. Place in the oven to cook for about 15-18 minutes, or until the chicken is cooked through and the vegetables are cooked but still crisp. While the fajitas are cooking, prepare lettuce leaves for shells and toppings as noted. Once the fajitas are cooked, remove from oven and allow to cool for a few minutes. 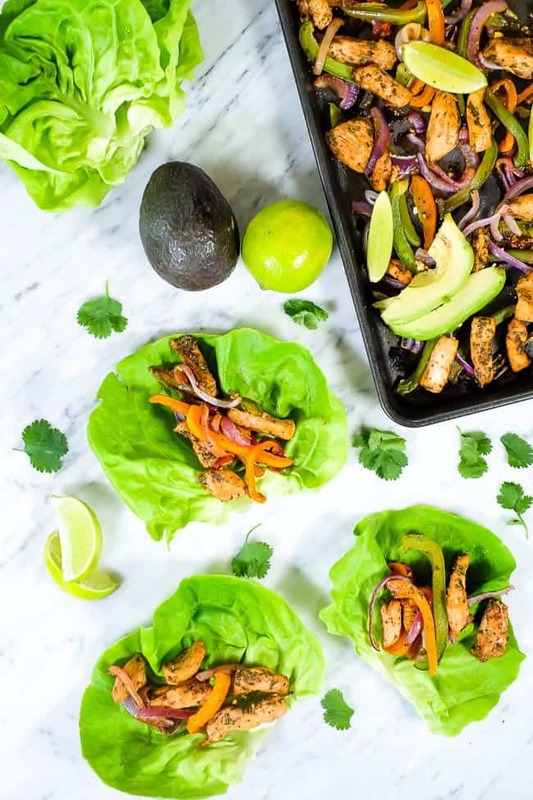 To serve, spoon fajita mixture into lettuce leaves, top with avocado and cilantro and enjoy. Made this tonight! Delicious! The chicken was flavorful and tender! Definitely going to be on rotation in my house for dinner. ( handles high heat & doesn’t take away from marinade flavor, in my personal opinion). Absolutely outstanding, beginning with flavor & ending with super easy clean up. Thanks so much for posting!! Will definitely make this again!!!! Made this tonight. Real good, real simple. Thanks for their recipe. Made this and loved it. My husband wants it as a staple in our menus. Made this tonight. 5 Stars. Hands down. I used exact ingredients, but not measurements. I was concerned how heavy the seasonings would be. So I winged it with the measurements. I’ve never used aminos with fajita spices Glad I trusted the recipe. Glad you trusted us and enjoyed the recipe! If you don’t mind using soy, you could use soy sauce (but start with less and taste since soy sauce is much saltier than coconut aminos). The brand Bragg’s also has an aminos product that is soy based that would be an option. If you have Amazon Prime you might just order online and make this one in a couple days once the coconut aminos arrive. They’re a really big part of the flavor profile for this recipe! This is my first time to leave a comment on a recipe I’ve found on Pinterest! 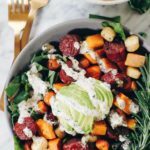 This recipe was so amazing, I had no choice but to! LOVED IT! Thank you for sharing!